This project was selected to be showcased at the Chelsea Gallery as a part of the exhibit called Murmurs From The Planet Earth. As a team we all contributed equally in conceptualizing and designing the user experience for this project. Once that was done, I led the product design and fabrication part of the project while my teammates led coding and soundscape generation. As our team consisted of a bunch of environmentally conscious and concerned people, we naturally started discussing how human activities have detrimental effects on our planet. We extrapolated the effects and imagined a dystopian world that can no longer nurtures trees, a world of adaptation in which new technologies have afforded alternative means of oxygen and the ability to extract personal histories from natural objects. The remainder of the last tree — a stump — now sits in the museum. The installation developed in this project serves as a living monument to the memory of the trees. But how would someone interact with a tree stump and experience these memories? Inspired by the study of tree rings, called dendrochronology, we sought to tap into previously inaccessible information, extracting and conserving tree’s memories. Each ring represents growth and with growth comes the experience and memories. Stimulated by touch, the stump releases distinct soundscapes and shares the history of how the planet transformed over different eras. This auditory experience is meant to encourage reflection on the impact humans leave on nature. The soundtracks are representative of four stages of a tree’s life — the birth, the interaction with all living beings, the perpetual chaos, and the eventual extinction. PS: No trees were harmed during this project! What would the Epitaph experience be like? What were the challenges while designing the experience? While designing Epitaph, we were faced with a few challenges, which required us to consider different approaches to test their effectiveness. How can we make sure that users know this is an interactive piece when it is displayed in the museum? This was perhaps our biggest challenge as it might be the case that Epitaph is displayed alongside non-interactive art installations. What if we put instructions next to Epitaph? It was distracting. What if we use proximity sensors and whenever someone passes by, Epitaph says “Hi”? This was especially confusing on a heavy traffic day when people kept passing by and Epitaph kept saying “Hi”. What if we put a big red button to invite users? Unfortunately the button was considered the part of the display and failed to invite enough users to interact with the piece. What if we keep the pulsing light of the rings on? Same thing happened. Finally, we decided to simply put a headset in the front. This was successful in inviting users to put it on. This was the start of the user’s interaction with the piece. How can we make the experience more immersive? In a museum environment where there could be constant movement and chatter, how do we immerse the user in the experience? We considered demarcating the area surrounding Epitaph through various methods (e.g. light or signs), but it wasn’t the experience we were aiming for. Fortunately, the decision of using a headset also solved this. If a user leaves in the middle of the experience, how can we provide the next user a fresh start? Each soundscape lasts more than 30 minutes. So if a user leaves the headset on the pedestal while a soundscape is playing and the next user puts it on, they may not know that this is not the beginning of the experience or may not feel the need to interact with the installation. To address this, we decided to include a reset button. But we imagine that there could be more innovative solutions. 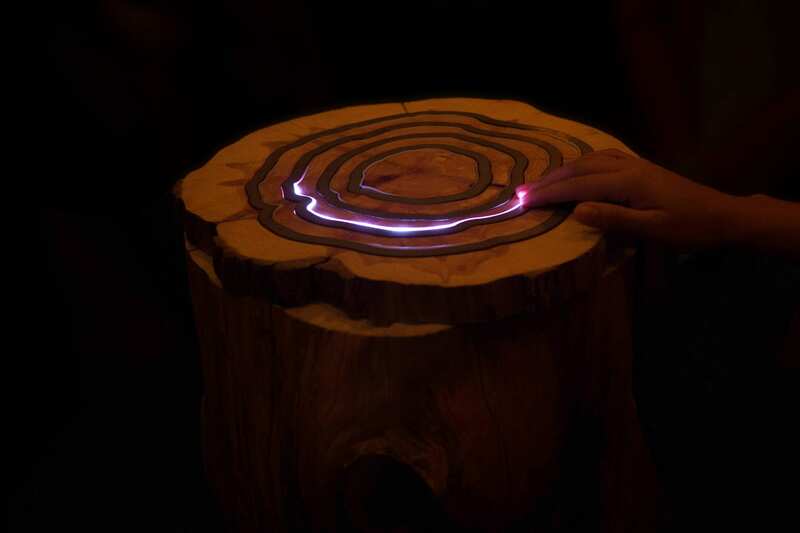 We started with an idea: what if we can interact with a tree and it can tell us stories? Once we were happy with the basic premise of this idea, we started brainstorming and sketching out how this might work. How would the interactions work? How would we source and process the wood? If we put metal rings where the tree’s rings are, where would the metal sit? 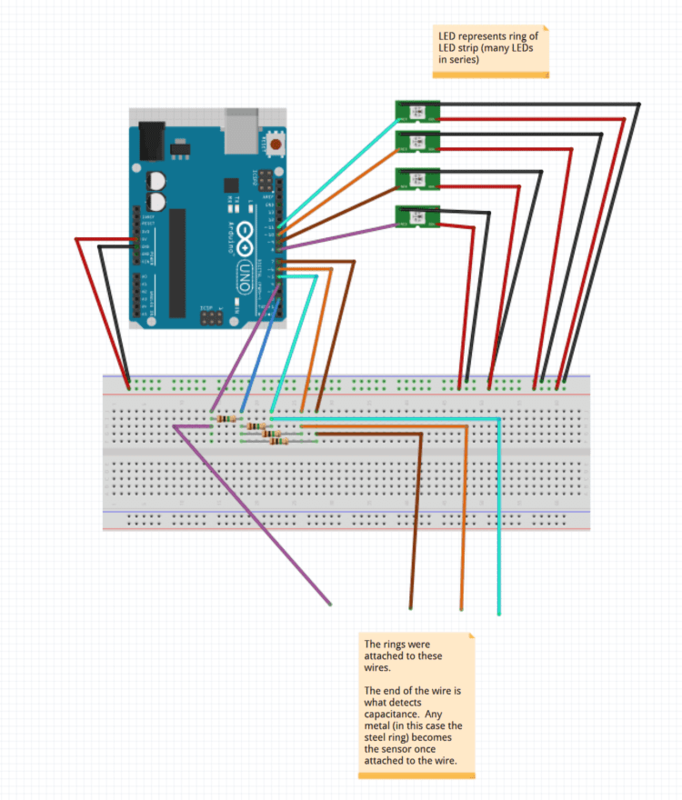 What types of sounds should the tree make? What would the experience be like? As we worked through all these questions, we came up with a set of initial sketches that we thought were feasible to be produced in 3 weeks. Before we dove too deep into the design, we wanted to build relatively quick prototypes to flush out the technical hiccups that might occur. We used CNC routing on a scrap MDF board to cut out our first “ring” shape before using it on a wood. We were happy with the results. The depth of the two gutters — which housed LEDs and metal rings — needed some adjustment but the finishing was promising and prototype worked perfectly well. In parallel, we started tinkering with addressable LEDs and capacitive sensors. They proved to be easy to work with, the code ran without a glitch, and we soon had a prototype. Now that we knew that our interactions and construction are feasible, we began working on the final piece. The last part we needed was the piece of wood that we would use. We wanted a stump with well defined rings. We found a friend who has property in Northern Westchester with a couple of recently fallen trees and a propensity for cutting things with chainsaws. After bringing the piece home, treating it, and planing it, we had a beautiful piece of red cedar. Simultaneously, we fleshed out the code, designed soundscapes, and plasma cut the metal rings to see if the interaction would work with all four rings. Once these pieces were ready, we moved forward with chiseling out the bottom of the stump to make room to hide all the wiring underneath. But there was still one more thing left: routing the gutters on the surface. These gutters were designed to hide the LEDs underneath the metal rings but leave just enough gap for light to escape to create a magical experience. We were ready, but it was a terrifying moment. We had only one shot to get it right. Thankfully, all of our drawings were precise and the CNC cuts went beautifully. The LEDs and metal rings all fit perfectly. It was an amazing moment to see all the pieces come together for the first time. Epitaph was selected to be showcased at the Chelsea Gallery as a part of the exhibit called Murmurs From The Planet Earth. Well, I’m looking for a full-time position. If you’re hiring, get in touch!